Ayers talks about leaving an era of fear based on 9/11, the typical liberal position that Bush was reelected based on fear of another attack… Well how about the fear of a complete economic collapse that camp Obama used in the election. Or how about the fear that Sarah Palin would have been one heartbeat away from the Presidency. Those were Fear based campaigns created by the Obama camp. Then he rambles on about creating new movements that the President has to react to… I wonder if these are the same movements as he advocated in the 60s. His wonderful wife then goes on to talk about the joy the world felt about the election of Barack Obama. Then she goes on to talk about this election proved the Bradly effect has been overcome… Well then case closed, the racist America that was potrayed prior to the election was proven false, thus the blaming the White man for everything needs to stop. And then… She tries to show that the Ayers controversy and the question that many of us have, who is Barack Obama and what does he really stand for, we do not know enough about him, is false… Sorry honey, I do not know enough about him. He has used this mask of hiding things from the public until he gets caught on it to hide who he is or his lack of experience. What is known about Barack Obama is minimal, less that we knew about Sarah Palin, yet she was only running for Vice President. Yet the media found everything out about her. Then the big denial… He only knew them casually… Read your husbands book… Family Friends. He has been vetted and vetted and vetted… No he hasn’t. He has been questioned by the people and we have not gotten satisfactory answers to those questions. The media has avoided any real investigation in him. Each time something comes out, he alienates those involved, including you and your husband. Then she goes into the African American man racism etc… Which she disproved by her statement of the Bradly effect not happening during the election. The fear of a black man as president was rejected by almost all sectors of the population… 52% honey… Those things had already been rejected prior to the election… Most of us that voted for McCain did so because he was the lesser of the two evils, it had nothing to do with race for us. This fear of the blackman was not a factor for us. By Ayers own adminission in his book, delayed to be released after the 2008 election, he and Obama are Family Friends. Remember Obama flatly denied this. Obama LIED to the public, made sure Ayers and his wife did not say anything to the press prior to the election. I do not care that he was friends with Ayers, it is the fact that he lied about it to the public and the public sucked it up. People of America, Wake UP! More Change You Can Believe In! In a new afterword to his memoir, 1960s radical William Ayers describes himself as a “family friend” of President-elect Barack Obama and writes that the campaign controversy over their relationship was an effort by Obama’s political enemies to “deepen a dishonest narrative” about the candidate. Ayers describes phone threats and hate e-mail he received during the campaign, and he bemoans Obama’s guilt by association. During the campaign, Ayers’ friendship with Obama was a favorite subject of conservative bloggers and talk show hosts who insisted the two were closer than the candidate was admitting. Ayers’ new description of the relationship seems to contradict Obama’s statements. A campaign spokesman told The New York Times last month that Ayers and Obama hadn’t spoken by phone or exchanged e-mail messages since Obama became a U.S. senator in January 2005. Obama himself denounced the “detestable acts” Ayers engaged in during the Vietnam era. He’ll appear Friday on “Good Morning America” to promote the re-issue of his book this week. The Tribune obtained a copy of the updated material. Obama was criticized by Sen. John McCain throughout the campaign for suggesting that, as president, he would sit down with the leaders of rogue nations like Iran and attempt to have substantive discussions. Well well well… Yep trying to hide something… It is not about protecting a source it is about protecting Obama… More Change You Can Believe In! How frickin’ stupid do they think we are? Someone gave the Times a videotape so it wouldn’t be released? And they can’t publish a transcript? I guess that’s the kind of executive talent the newspaper business is attracting these days. However, I received a tip from a person who has provided useful, accurate and unique data from LA before (e.g., “All six of CNN’s ‘undecided voters’ were Democratic operatives“). Take it for what it’s worth, but I believe this person is on target. It would be really controversial if it got out. Tha’s why they will not even let a transcript get out. Why won’t the Times release the tape? They’ve now come up with four reasons over the past few days for suppressing the video. None of the answers make sense. As for their most recent excuse (they promised not to release it) Ed Morrissey asks the critical question. Why believe the tip? While I receive a lot of tips and links, I seldom publish them. This particular email address has provided accurate and unique information in the past, as I noted above. No one else reported the information and I found it to be accurate in the past. As I said, take it for what it’s worth. Why doesn’t the Times just publish a transcript? Why indeed. Update II: Debbie, who apparently broke the original tape story, has a suspected source for the video.Charles Johnson and Gateway Pundit have excellent summaries. 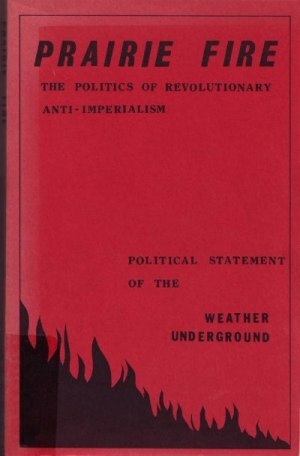 A little green birdie dropped off a package for us; the PDF version of Barack Obama associates “Billy” Ayers’ and Bernardine Dohrn’s 1974 communist declaration of war against the United States. Includes the dedication to Sirhan Sirhan, assassin of Robert F. Kennedy, on page 5. You may have read about this book, or seen it mentioned on Hannity and Colmes, but you cannot appreciate how radically insane and violent it is until you read it for yourself.